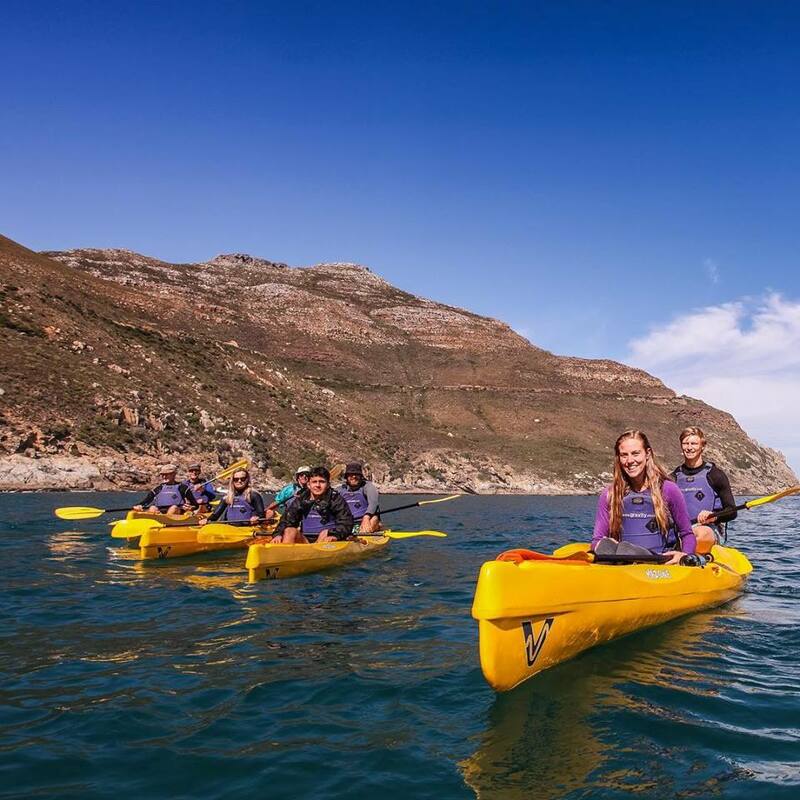 Gravity Adventures uses different locations for their mobi-kayak tours to make the best use of Cape Town's weather. Photo: Gravity Adventures. 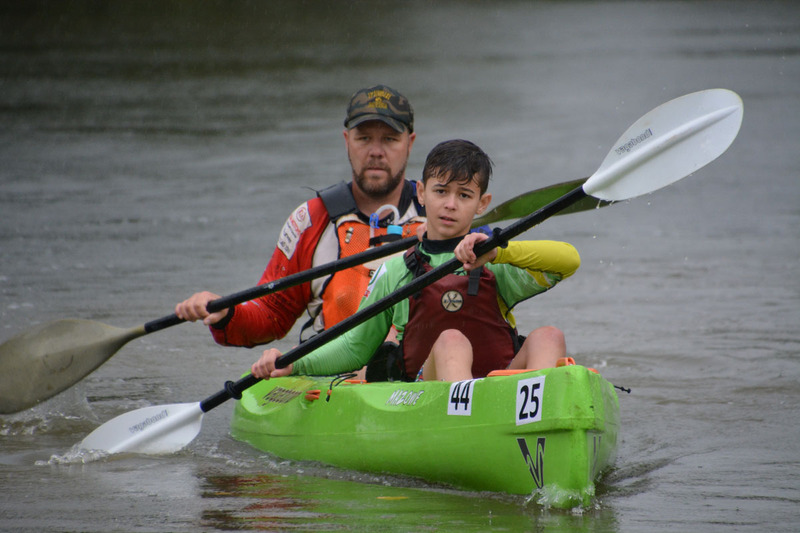 Mazowes are superb kayaks for novices to paddle. They quickly get the hang of steering. Photo: Gravity Adventures. 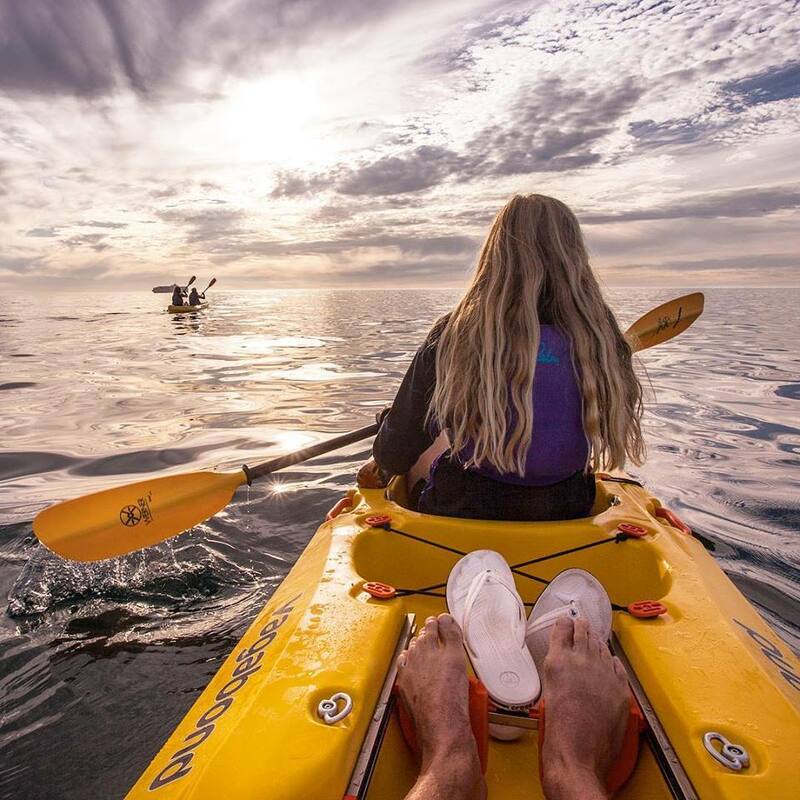 A calm day in Cape Town - perfect for a mobi-kayak tour with Gravity Adventures. Photo: Gravity Adventures. 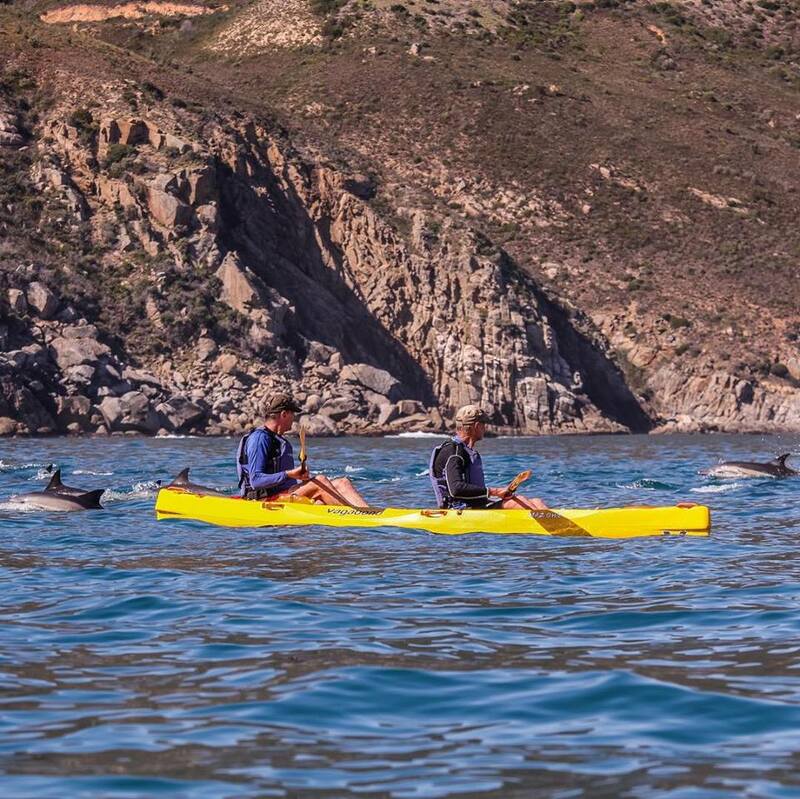 In season, dolphins, seals and whales may be seen on kayak tours. Photo: Gravity Adventures. 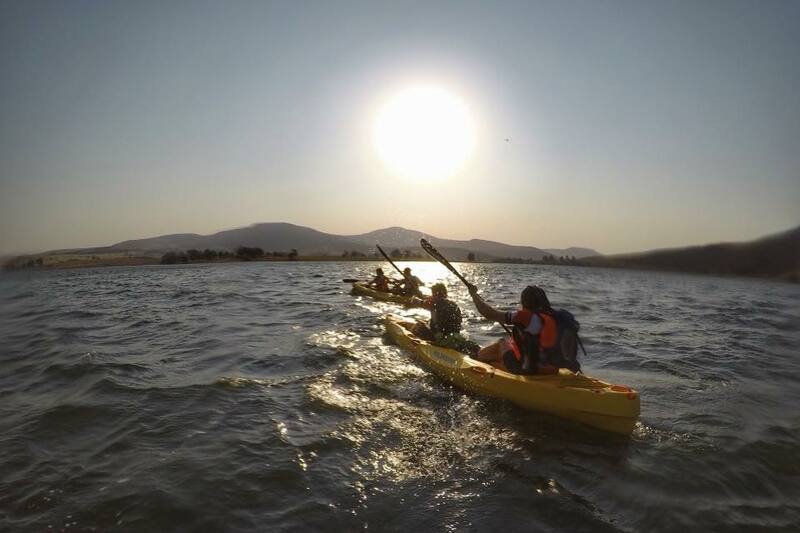 The Mazowe is quickly being favoured by operators for kayak tours and kayak hire. Photo: Gravity Adventures. 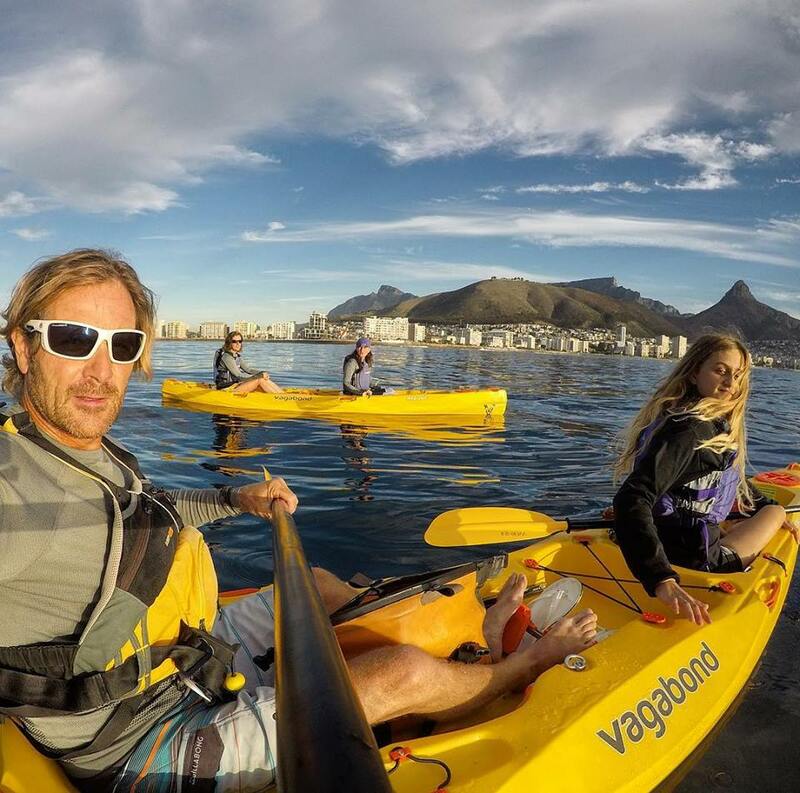 Gravity Adventures used Mazowes for their mobi-kayak tours in Cape Town. The best way to watch the sun set. Photo: Gravity Adventures. 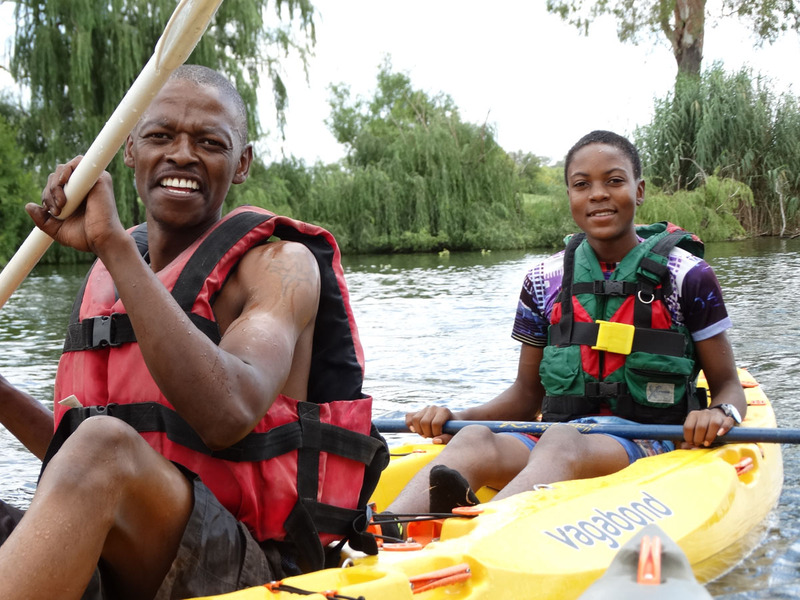 Paddling together on the Mazowe is always fun. 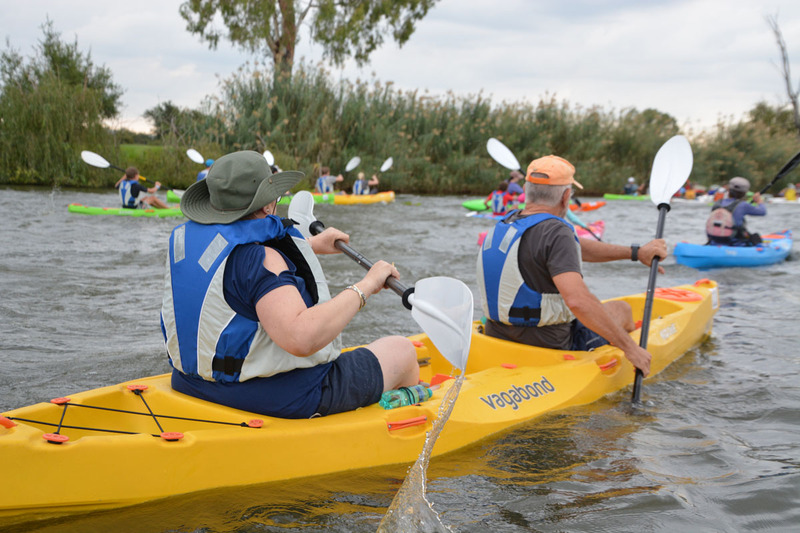 Friends and family groups enjoy paddling with and against each other. 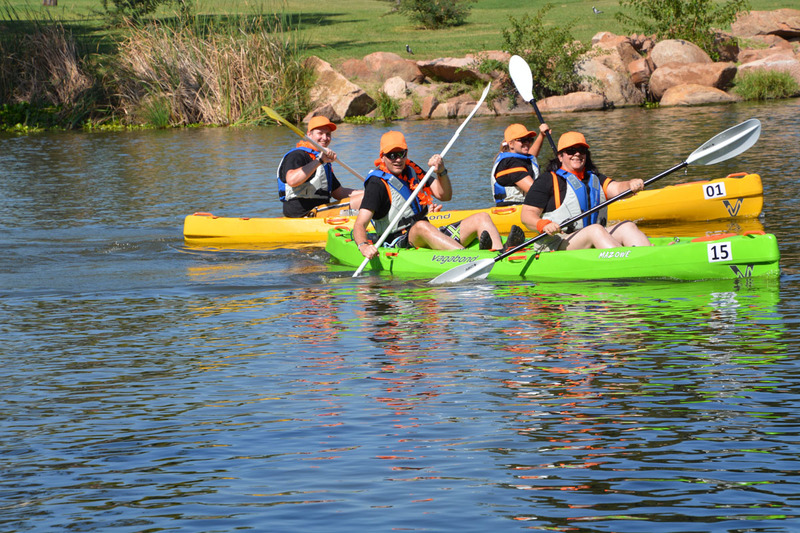 Double-seater kayaks are perfect for group paddling. 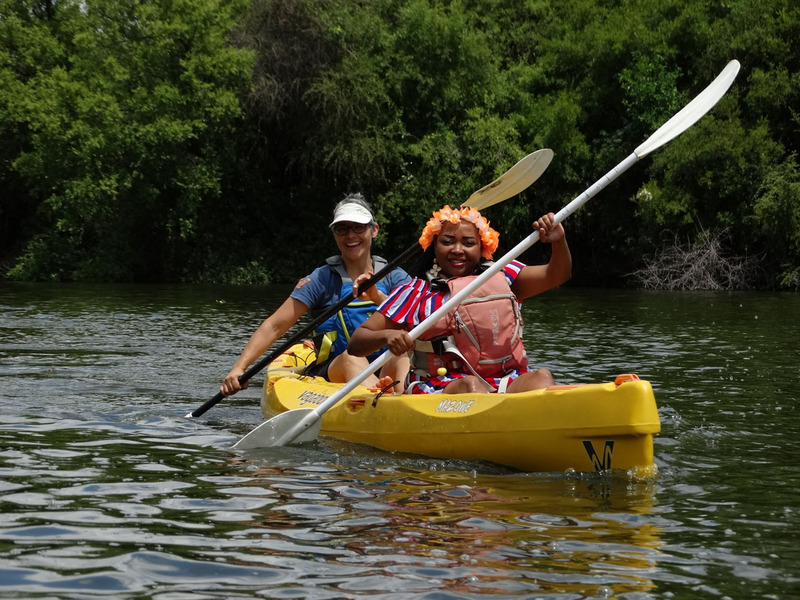 Paddling is the most fun when you paddle with a friend. Children make up their own paddling configurations. 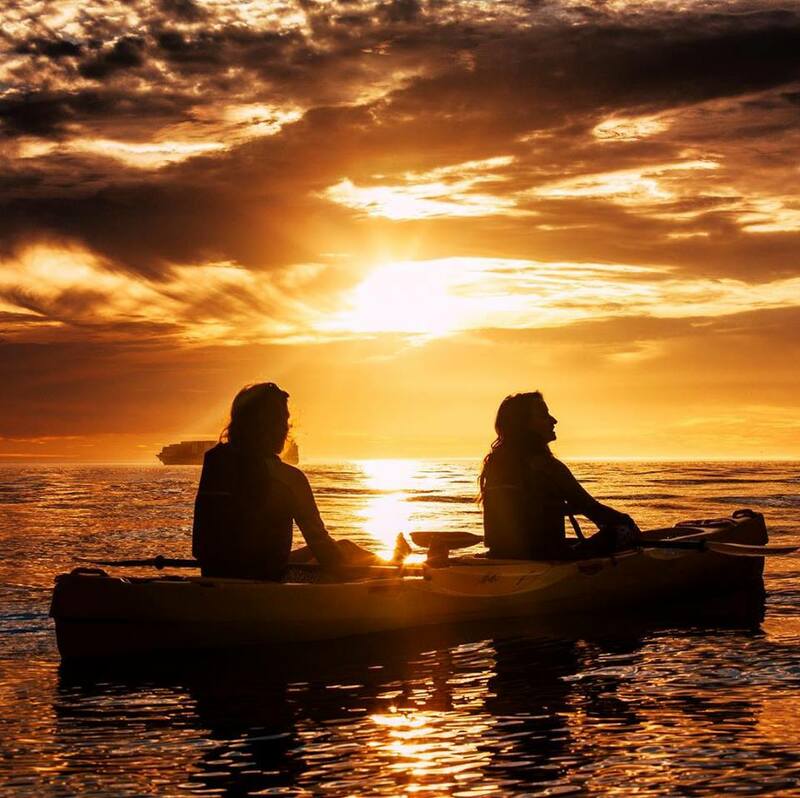 Paddling with a friend is a laugh. Small children fit comfortably in the tankwell of the Mazwoe. 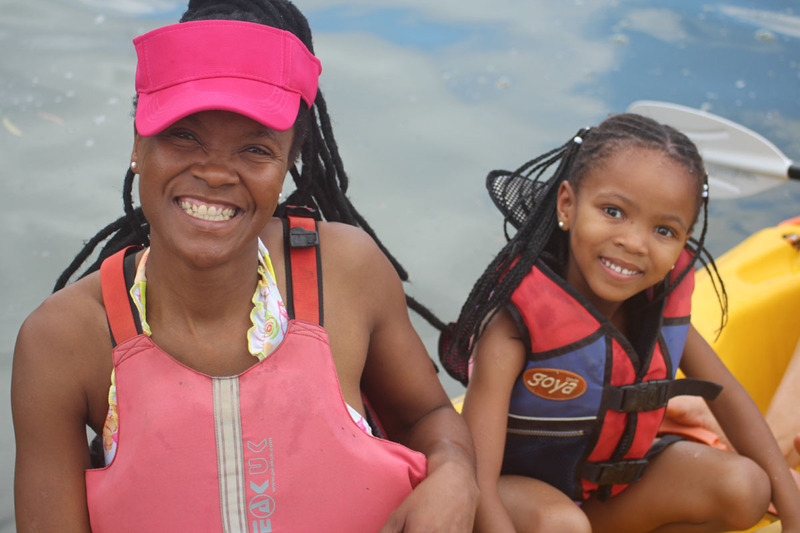 This aunt took her niece out on the water for the first time. 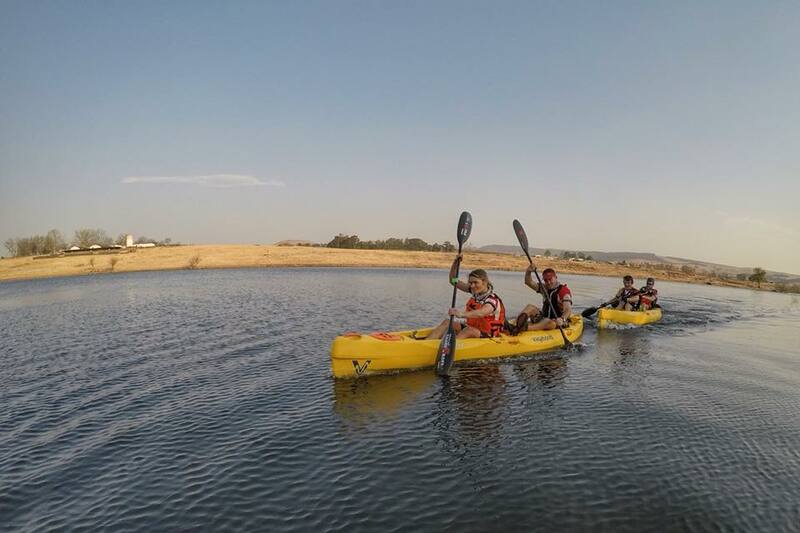 It is a treat for children to paddle with a parent. 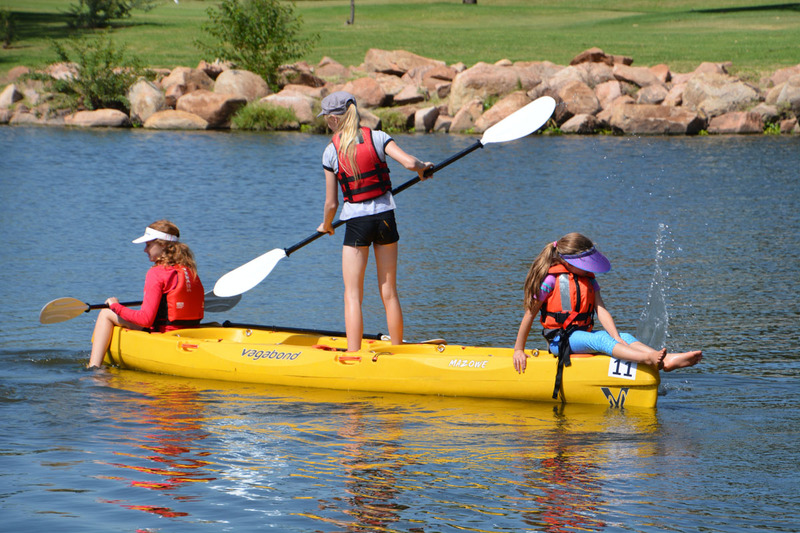 Paddling a double-seater kayak is an activity that parents and children can enjoy together. 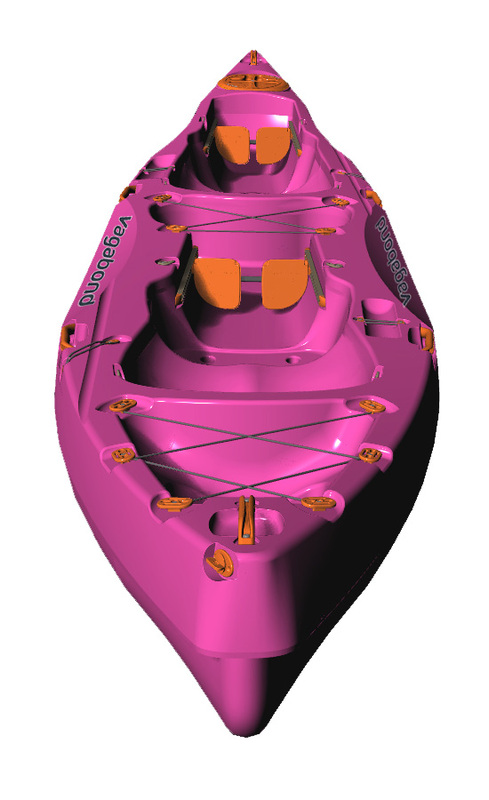 There is more than enough space between the front and back paddler. 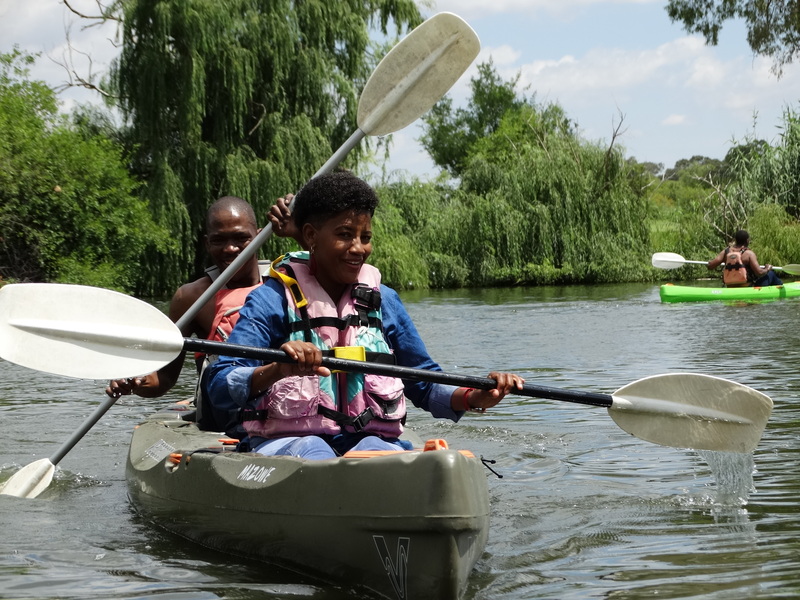 The Mazowe is a great kayak for first-time paddlers. 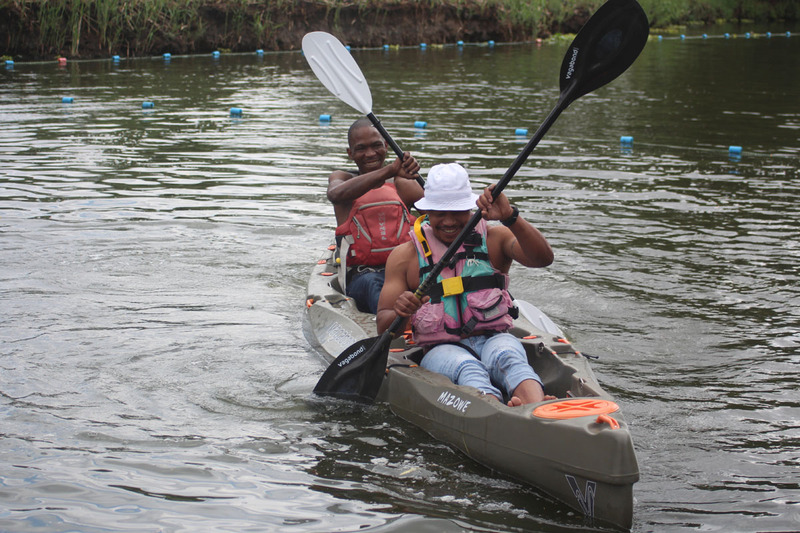 It is a good confidence builder for a less experienced paddler to go out with a more experienced paddler in the Mazowe. 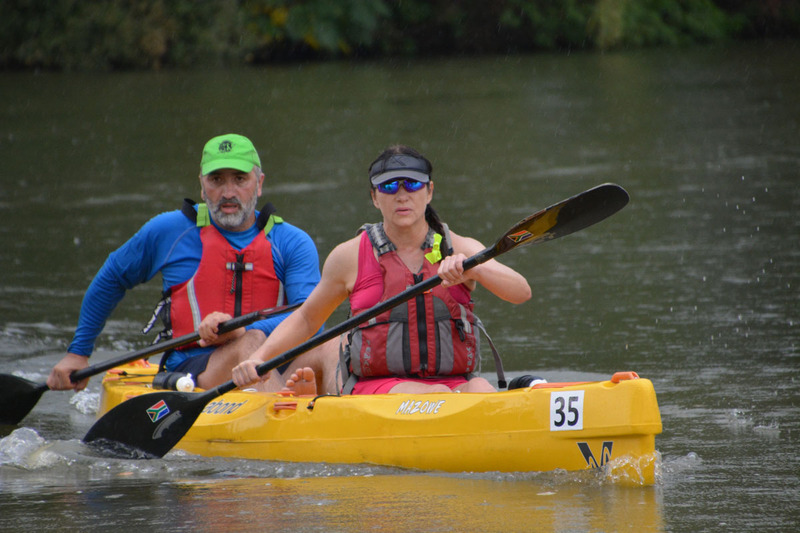 A husband-and-wife pair enjoy paddling together. Team KeyHealth Nevarest at Team Cyanosis' Midlands adventure race. Photo by Greg Avierinos. 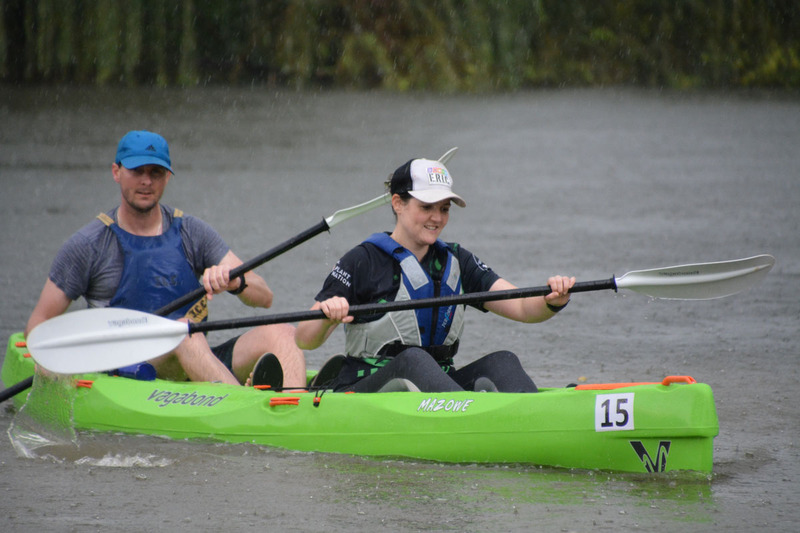 Team KeyHealth Nevarest at Team Cyanosis' Midlands adventure race. Note the generous spacing between paddlers. Photo by Greg Avierinos. 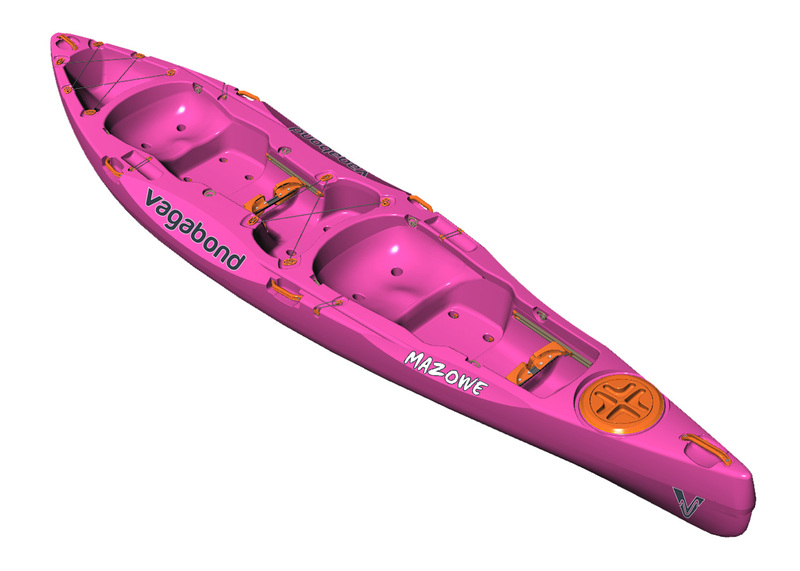 At 4.3m long and 86cm wide, the Mazowe is a sizeable kayak with a carrying capacity of 230kg. 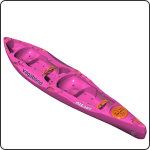 That said, the Paddle Cutaways make it feel like a much narrower kayak. 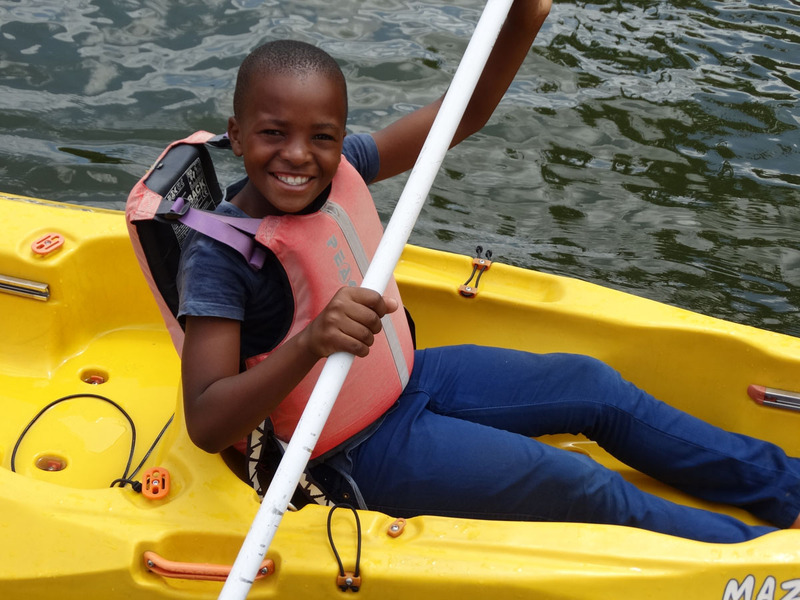 And this is why children love this kayak too. 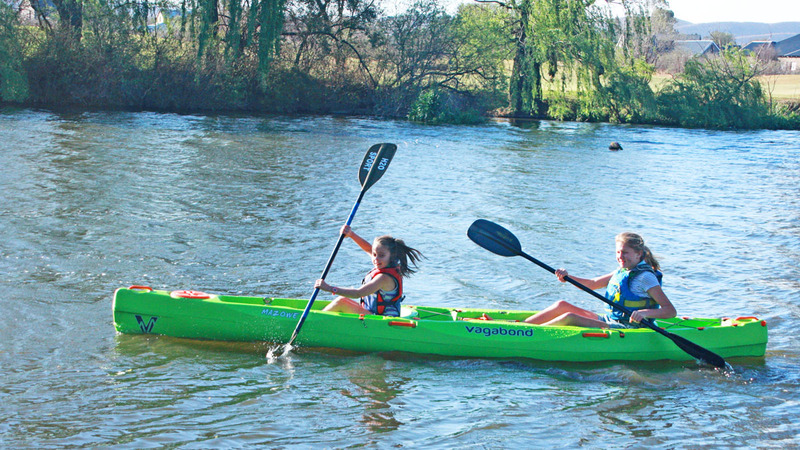 They can paddle it with witha friend, with ease. 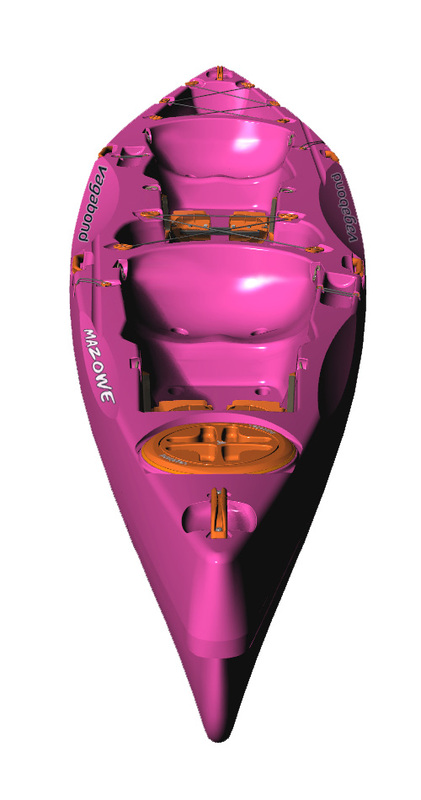 The rear paddler's footwell flows into a tankwell to maximise storage space. The rear tankwell can stow a good volume of gear. Mazowe: view of the stern. 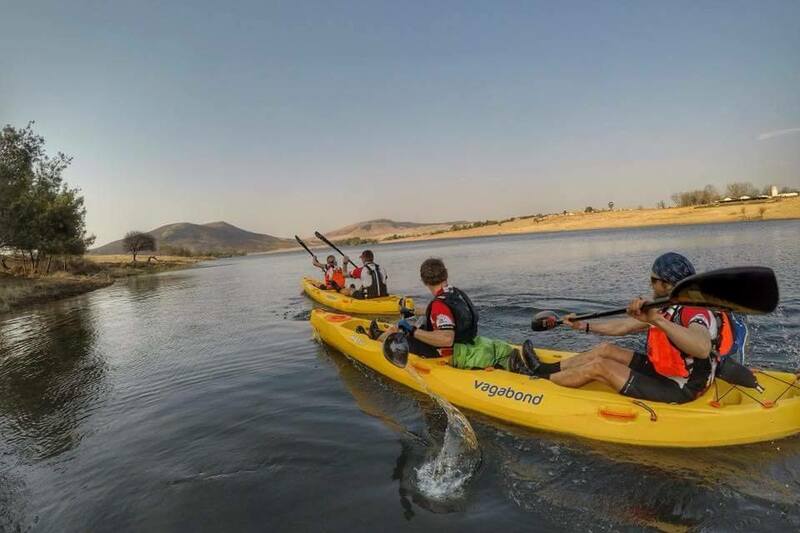 Generous space between the paddlers means that the rear paddler can put in a full paddle stroke without bashing the front paddler. Sculpted seats make for comfortable seating. 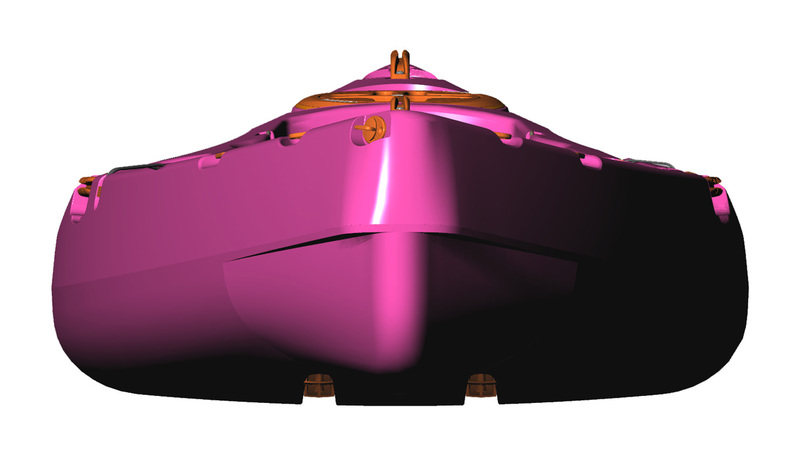 View of the bow of the Mazowe. 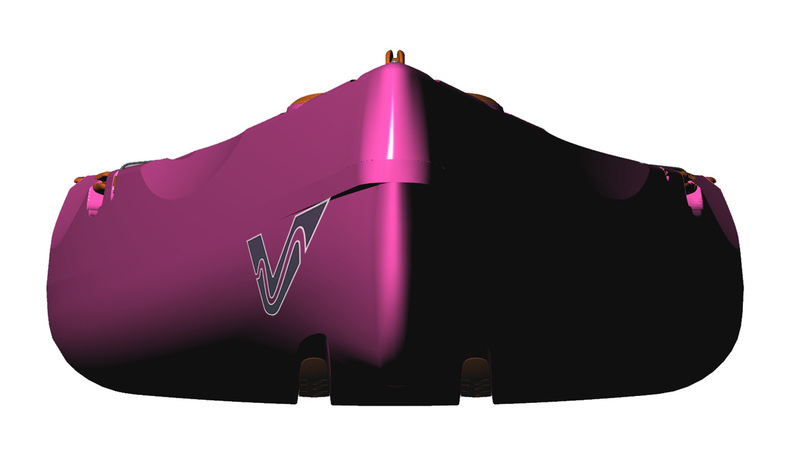 Side profile of the Mazowe. Our scupper venturi system drains the seat, footwells and tankwells of water. 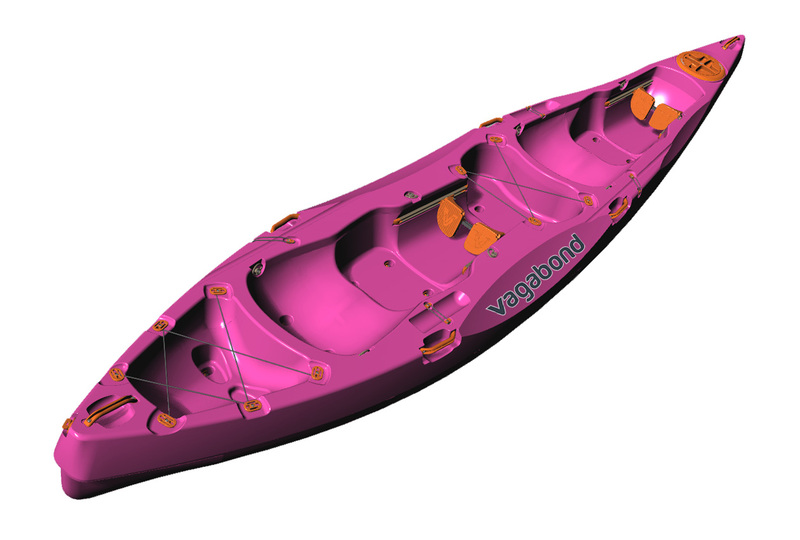 In addition to the rear tankwell, we've allowed the footwell of the rear paddler to flow into another tankwell behind the front paddler to maximise storage space. 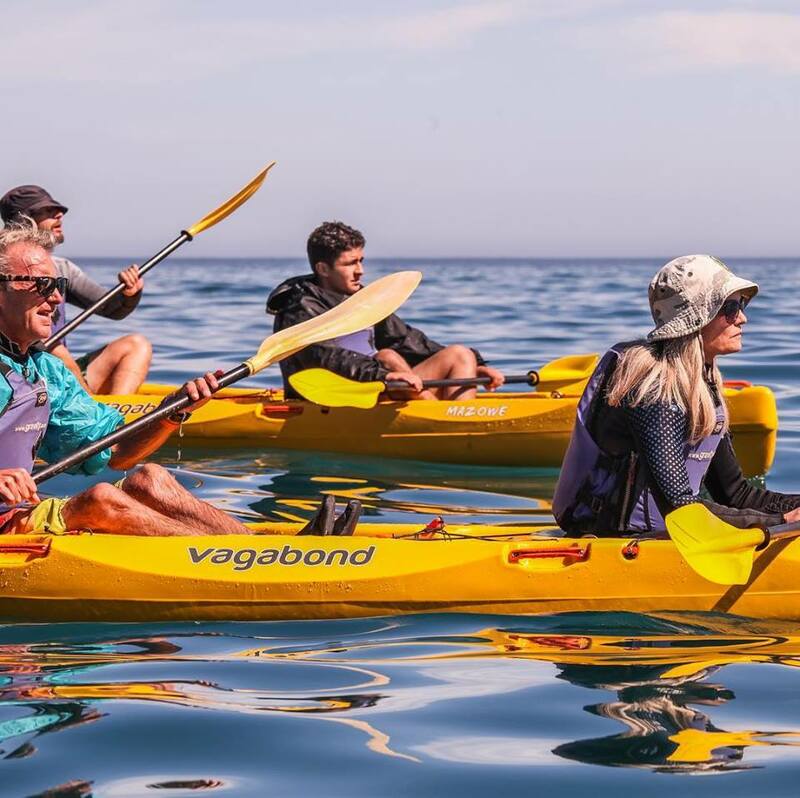 We've made enough space between the paddlers especially for the rear paddler to enjoy a full paddle stroke without whacking the front paddler.